As regular readers know, I have become very sceptical about the benefits of externally requiring a hoof to conform to human ideas of what is "correct" or "normal" - often described as trimming. 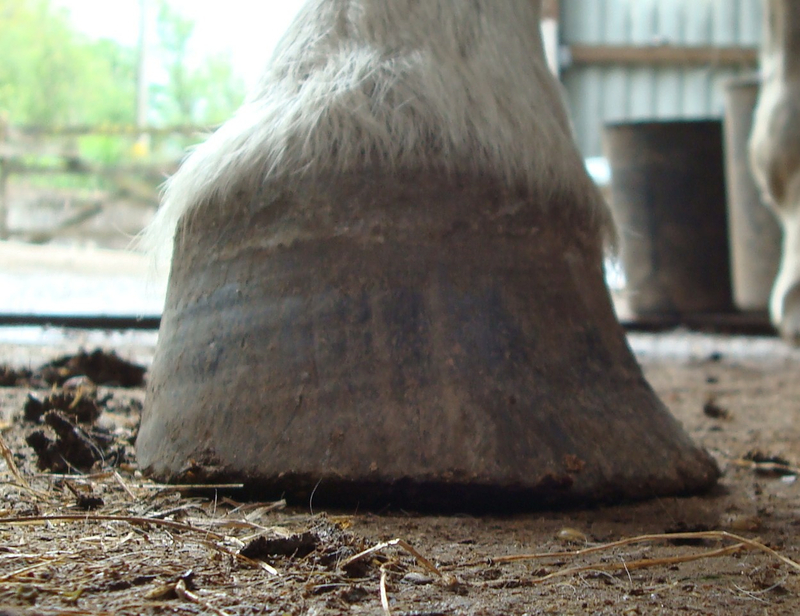 Ironically, many farriers and trimmers look to the mustang hoof as a sort of holy grail. 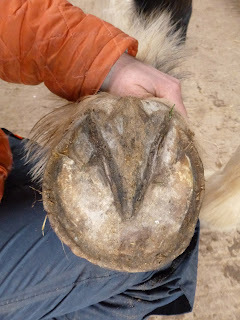 Trimming a hoof to make it appear like a mustang hoof is sometimes used as a justification for changing angles, heel height, breakover and all sorts of other aspects of the external hoof. Its as if we believe that if we make it look like a mustang hoof it will somehow function like a mustang hoof. 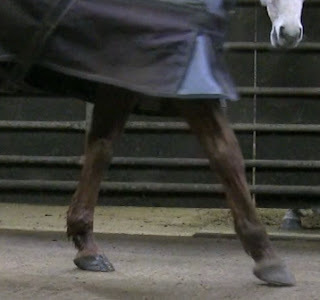 But appearance is far from being everything, and in my experience changing how a hoof looks - without paying a great deal of attention to the more important question of how the hoof is landing, loading and supporting the limb - can be counter-productive. 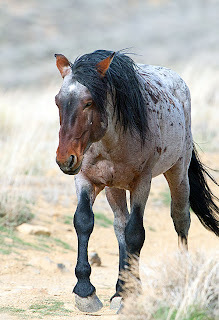 But there are important lessons to be learned from mustang hooves, because the horses who have them cover huge mileage on tough terrain and something is obviously working. The horse above has a very similar medial deviation to Dexter's, which so many well-meaning people would love to trim off(!) 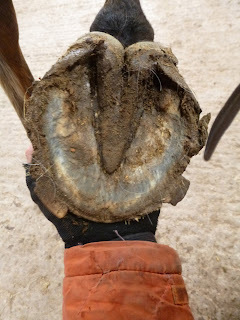 and the horse below has a similar toe profile to Charlie, who like the mustangs has covered many miles, very happily, with his apparently "abnormal" hoof. The important thing about these hooves is that they belong to horses who are sound, healthy and thriving in a harsh environment - in contrast to the apparently "perfect" mustang cadaver hooves which we are more used to seeing - and they pose some rather interesting questions about whether what we think of as "correct" or "normal" really IS what the horse requires. Perhaps its us who should be adjusting our perceptions, before we attempt to adjust our horses' hooves! 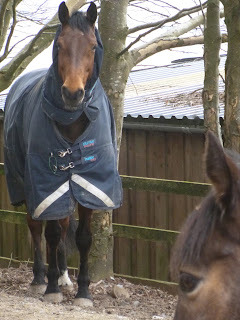 Wally and Ruby look pretty astonished, but I think its worse at home! So far we haven't had the heavy snow which has blighted other parts of the country (though its snowed overnight and coming down quite persistently this morning) but its well below freezing day and night and more like January than March. Beanie and Red are staying focussed. "We've got haylage, we are out of the wind, now go away and leave us to munch!". Luckily I've still been able to get horses out exercising - the school is as hard as concrete and impossible, but at least the roads are ok - but its frightening to calculate how much haylage I am still feeding to the horses and cattle. ...but they get distracted and Ruby muscles in! 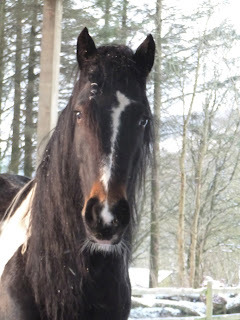 Paddy, like most horses, has settled in very quickly but I think he - along with the rest of us - would be grateful for a bit of sun on his back and some grass in the fields. Maybe next week? These feet belong to Paddy who arrived at the weekend as Remi went home. We had a grey Paddy here last year but this year's Paddy is a bay TB who came out of shoes just 6 weeks ago. 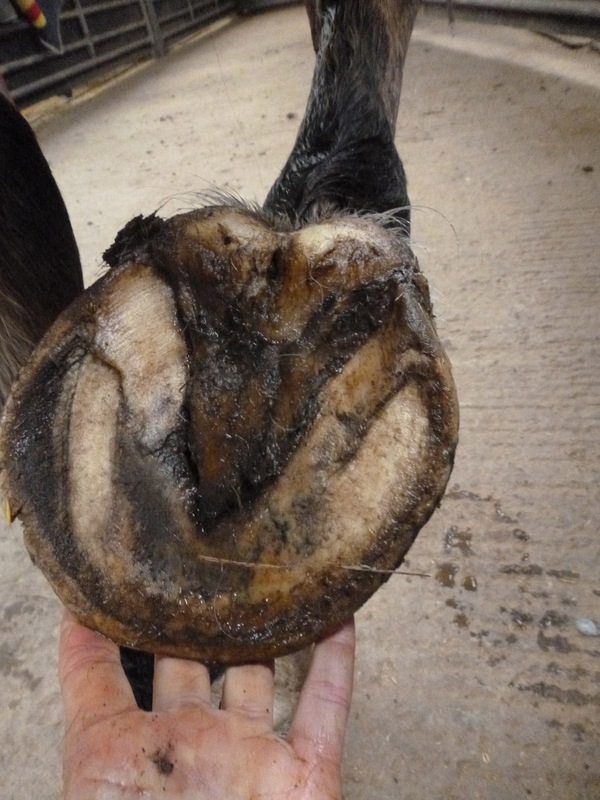 He was diagnosed with lameness which blocked to the navicular bursa and was 4-6/10 lame on a right circle when assessed by his vets. As you can see, his feet have already started changing in the time since he has come out of shoes (just check out the angle of the new hoof capsule at the coronet, for a start!) but there is lots of work for him to do to improve the palmar hoof. Onwards and upwards, Paddy! Here he is day 1 - a nice strong foot and already with a heel first landing but his medio-lateral balance wasn't right. 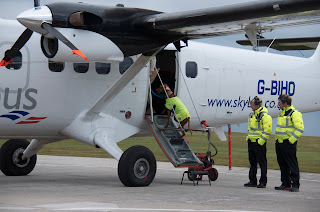 Tell-tale signs are that he wasn't landing straight and had collateral ligament damage on MRI. 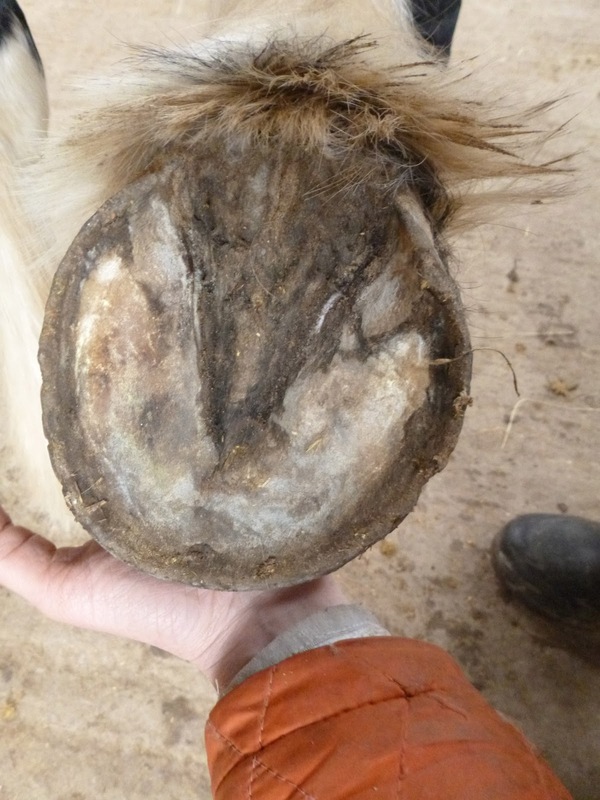 From the outside, his hairlines are also bulging at the quarters which is often another giveaway of uncomfortable hoof balance. 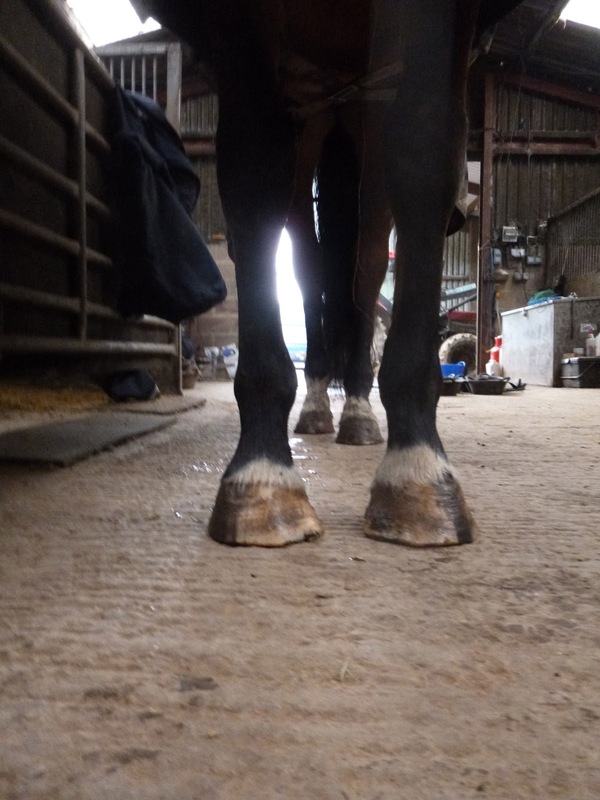 After 3 weeks his hairlines are already improving, his toe is shorter, his foot is less under-run and - due to his established heel first landing - he has been able to put in the miles, which has helped kick-start faster hoof growth too. Sole shots confirm what we can see in the lateral view. There was some weak, crumbly hoof wall especially at heels and quarters which is already nearly gone (no trimming required!) and his heels and frog look healthier and more robust too. Just a quick shot of his LF as again the hairline is changing, which is a good sign. He is getting hairier, too, so maybe I will ask Rachel to bring her clippers down when she comes to visit! These are Ruby's feet - easily distinguishable as she - unlike Rolo - has a full set of feathers! You can see from this angle that the heels are coming back and the frog looks more active. Like Rolo she had started to land heel first before she came (though this was less established than Rolo's) but she also has issues primarily with medio-lateral balance, as well as having flatter feet and thinner soles than Rolo. You can see in today's comparison shot that she is developing more concavity - and you can also see evidence of old bruising, which happened a couple of weeks before she came down here. The RF has changed even more dramatically. The frog is really beefing up and although the old bruising is clear here too, here soles are becoming healthier. 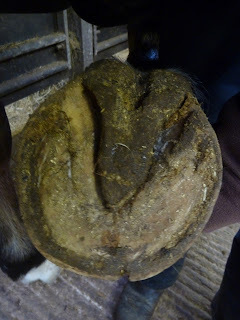 You can already see that the foot is beginning to load differently - and in another few weeks that tatty, flared hoof wall will mostly be gone as well. I'm pleased with them both and hope to have lots more to report on them soon! Remi is going home at the weekend so this is his last set of photos. As always, its fascinating to chart what has changed in his hooves over 13 weeks - and to guess where they might be heading over the next few months. ...and today for comparison. The toe is much shorter and the back of the foot more supportive. 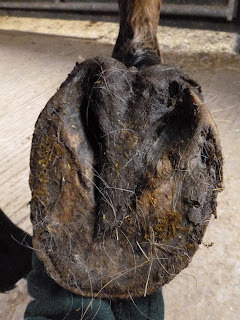 There is also a new angle of hoof growth in the dorsal wall which will shorten the toe still further. You can also see from the pale, unpigmented stripe of hoof wall how much the angle of the capsule has already changed. The sole shot is interesting. It wasn't a bad foot to start with but the frog is working much harder now and the foot is rebalancing. It has much more concavity but you can see there was a black area of damage at the toe. 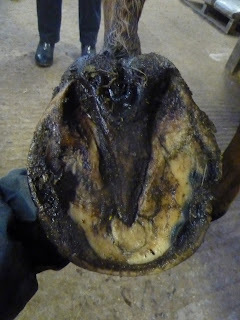 There are still black areas of sole which are growing out - it will be interesting to see if they disappear completely. 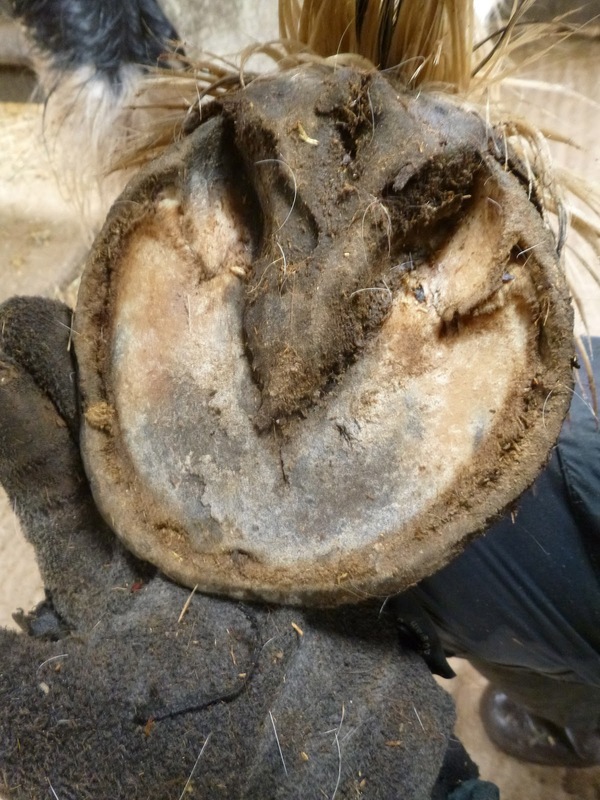 I have a suspicion that the medial wall deviation will disappear as the rest of the new hoof capsule grows down because the angle of change may mean his foot is balanced without it, but I could be proved wrong! His heels also need to continue to become more supportive. He's made a good start but its not yet as supportive as the heels on the LF. Stupidly I don't have a direct comparison shot to show you but you can see in the photo above that on day one Remi had a toe crack. That's now gone but naturally as he still has only half a new hoof capsule then his hooves will remain a work in progress once he is at home - and for at least the next 3 months. This is the shot of his feet today. I'd expect better balance again in a few more months. You can nevertheless see that he still needs more medial support to have a level hairline, particularly on the RF, and its this foot which has the most dramatic changes. 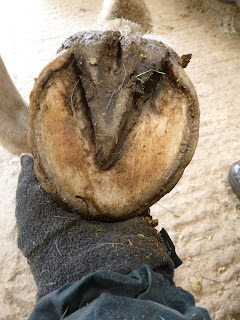 The LF was less underrun to start with - contrasting the angles today its much less dramatic than the RF but the whole hoof is weighted towards the back now rather than towards the toe, as it was, which is a good sign. 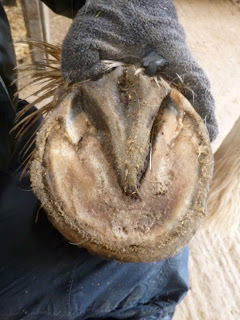 Again, there is a new angle of growth which will shorten the toe still further and load the palmar hoof even more. 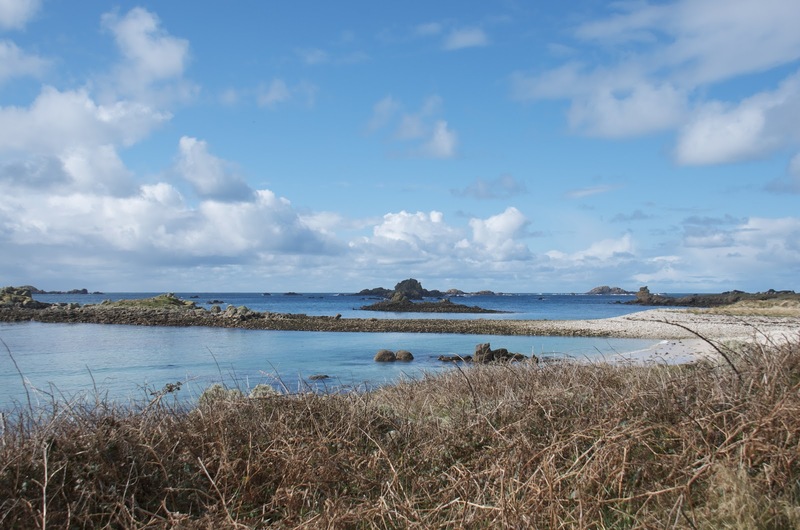 Meanwhile, massive thanks to Edward and Catherine who took care of the horses and cattle and to Alan who helped them out, kept the home fires burning and baby-sat Barney and Baxter to their evident bliss and total satisfaction. ...trying out many new forms of transport! 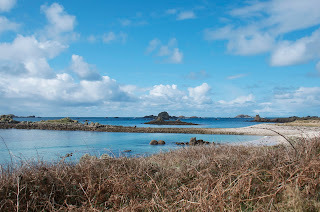 I can highly recommend the Scilly Isles when its snowing on Exmoor! Flare, deviation and does it really matter? 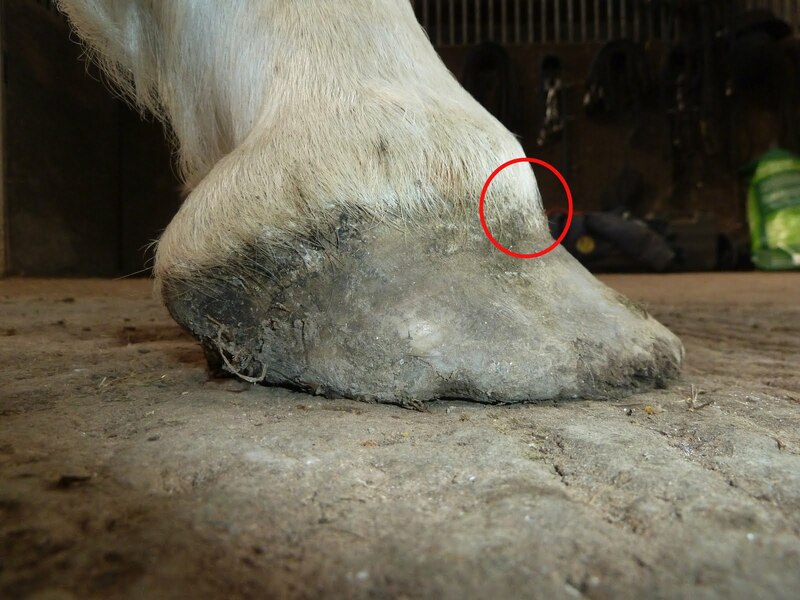 There has been a discussion running on the Phoenix forum about flare and deviation in hooves. Its a subject that recurs fairly frequently and usually begins with someone asking how on earth you tell the difference between them. 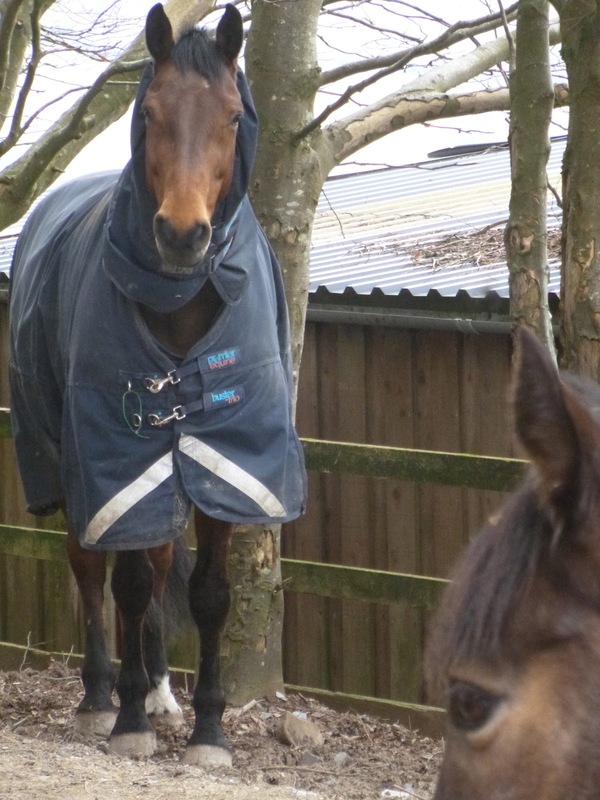 Trimmers, other equine professionals and (of course!) owners often focus on flare (or deviation, or whatever you want to call it), not least because its visible. This is particularly so when a horse first comes out of shoes but you also frequently hear statements like "Oh yes, he needs to be trimmed every 6 weeks to keep the flare under control". I've posted a lot about deviations, odd-looking feet, symmetry and so on over the years and its because the less I do to feet, the more interested I am in what feet do for themselves. 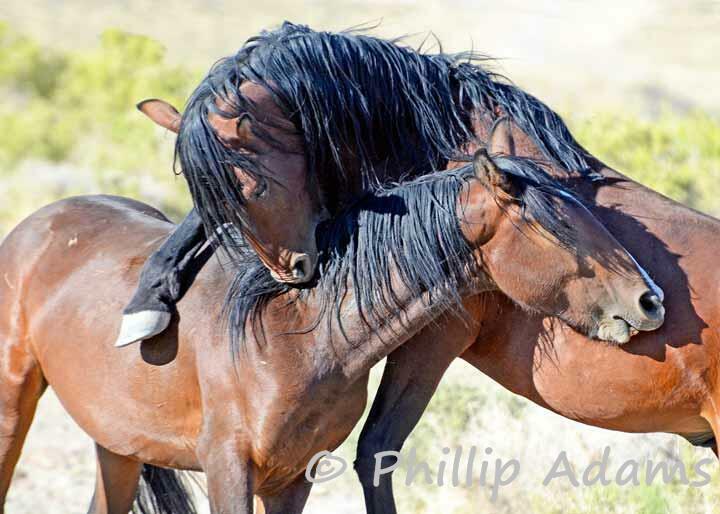 Very often, horses know better than humans how their feet should work. We are typically more concerned with appearance but horses are only concerned with function and what works best to enable them to be as sound as possible. 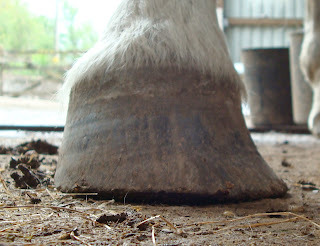 In the past I've defined flare as being stretched white line and deviation as being a supportive hoof wall adaptation. That's ok as far as it goes, but what about a practical way to tell what you can safely trim and what you can't? Think of it this way...In this photo, the hands of the adult are a vital support. Without them, little Jimmy (or whoever he is!) would fall flat on his face and there would no doubt be tears and trauma. In time he won't need them, of course, but for now the extra hands are essential. 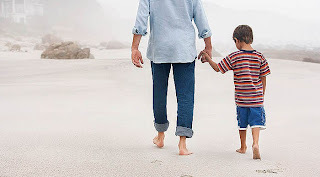 Another photo, another adult holding a child's hand - but the purpose is quite different. 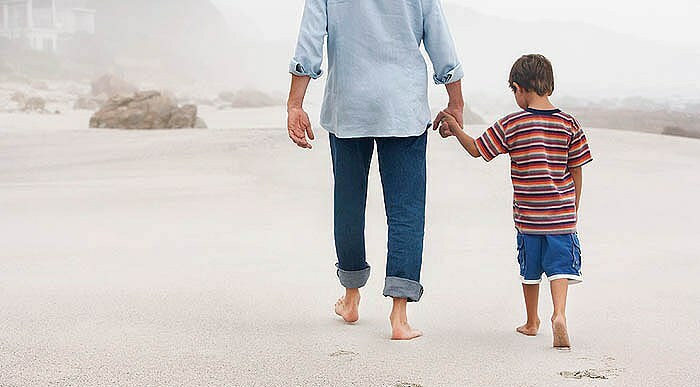 Take away the adult's hand in this photo and the child would continue walking along quite happily. The hand-holding isn't supportive at all. This to me is the difference between flare and deviation. But here's the thing...The difference doesn't really matter! Of course, it does matter if you are proposing to take the hands away. In one scenario it would be a disaster. Similarly, if you are going to trim a horse, you'd better be pretty sure that you are taking off non-supportive flare rather than supportive deviation; if you get it wrong you will end up with a sore, less-sound horse. But the real beauty of flare/deviation and the reason it doesn't matter which your horse has (provided you don't want to trim it off!) is that it won't matter to the horse either - as long as you leave well alone and leave the decision to him! Why? Because flare, although ugly, is by its nature weak and therefore its benign - it doesn't matter (from a structural point of view) whether its there or not, it won't affect soundness and as the horse works on tougher surfaces the flare will wear away and disappear. If the flare is (as is commonly the case) the result of a previously poor diet or poor shoeing then as a healthier hoof grows down it will simply go away on its own. 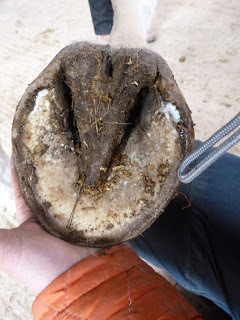 We always used to be told that leaving flare in place would lever away at better-connected hoof capsule but that just doesn't happen because the flare is stretched white line - its weak and compromised and is no match for healthy, well-attached laminae. By contrast, deviation is an essential support. 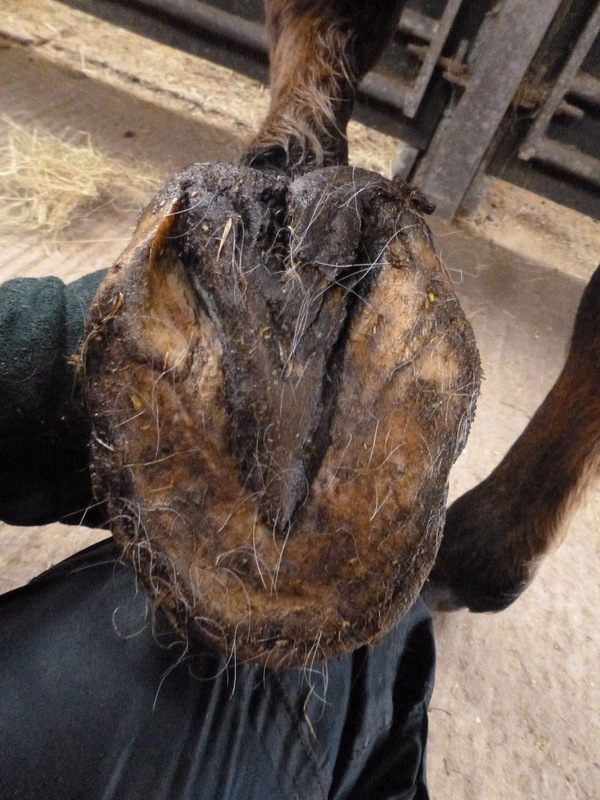 If you trim it away it will rapidly re-appear unless and until its no longer needed to assist in the limb's movement and load-bearing - and while the horse is without it, he will be less comfortable and less capable, especially on tougher surfaces. So why would you want to take it away? If you were the adult, and you weren't sure why the child was holding your hand, you wouldn't simply pull it away, would you? Don't you think it should be the child - who knows what he needs - who makes the decision whether to hold hands? I posted photos of Red earlier in the week. 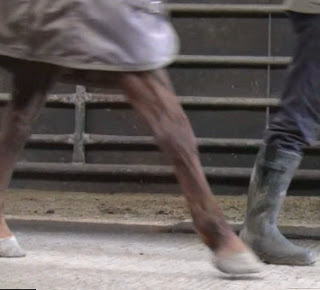 Of course, I post photo updates because they are a fascinating hint of how feet are changing and which direction they are heading in but photos can only tell you so much and - if a horse is not getting sounder - it is largely irrelevant whether their feet look prettier. With that in mind, here is Red's footage which I grabbed on Tuesday. I forgot to put date captions on but the first clip was taken on 10th Feb and the second on 12th March. And for those who can't see the video or haven't time to look at it, the stills are taken from the clip and compare Red's landing over her first 4 weeks. 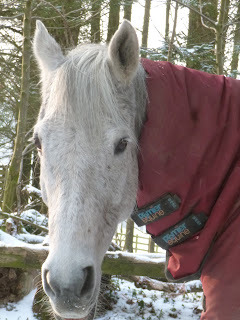 This is her on 10th Feb; although she was happy to walk on the concrete she is landing toe first and can't fully extend. A still from the same phase of her gait on 12th March shows a better landing - not as fully heel first as she will be but a big improvement. As a result, her stride length has increased and she is much freer and more comfortable in her neck and shoulders. Not all horses can make such big improvements in this short space of time but Red was able to start work very quickly and that - plus her love of stomping about on the tracks - has been a big factor in the speed of this change. Wally has his 4 week anniversary today and even though he came with a lameness that didn't block to the foot, it is interesting to see how his feet are changing. His biggest issue is with his LF check ligament but - as always - how the limb loads is reflected in the foot. His RF wasn't bad when he arrived but already his toe has shortened and his heel and digital cushion are becoming stronger. You can also see how far the nail holes - from the shoes that came off a couple of weeks before he came here - have grown down. 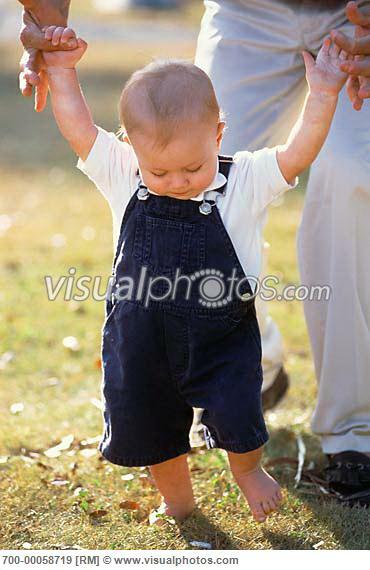 ...and his heels and frog are just beginning to be more supportive although he has very flat feet still. This is the LF and again the nail holes clearly show how much foot has grown in 4 weeks. There is also the hint at the coronet of a steep new angle of hoof growth which will become clearer in the next couple of weeks. That will improve his concavity as well as bringing back his breakover. Its a subtle change, but to me it looks as if the back of his foot is also building up, though it hasn't changed as fast as the RF. The toe is already ahead of where Wally wants his breakover to be; you can already see that in a few weeks his breakover (and eventually his toe) will be about halfway between the apex of his frog and where the toe currently ends. The sun shines - and that means 14 hour days! 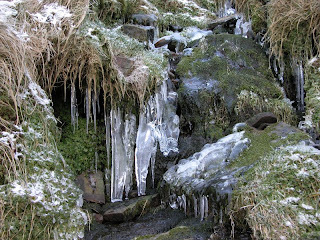 Word from a new blogger!